It is replaced by the Datamax-O'Neil I-4310e Mark II. The I-4308 printer is perfect for applications that demand printing very small labels, high-resolution graphics, or two-dimensional barcodes. 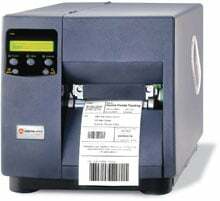 Some applications the I-4308 can be used for are producing small labels for tracking small parts with high resolution barcode labels, printing high quality graphics for identifying wiring harnesses, or adding an intricate Datamatrix or PDF417 barcode label to a package. All units ship with product documentation. Thermal transfer, 305 dpi, 8 ips, 4.16" print width, parallel & serial interfaces, 16MB DRAM, 2MB flash. Includes cutter & US power cord. Order cables separately. See accessories. Thermal transfer, 305 dpi, 8 ips, 4.16" print width, parallel & serial interfaces, 16MB DRAM, 2MB flash. Includes US power cord. Order cables separately. See accessories.